For 2017, Hobbs Valve is going to take time out each month to celebrate some of the UK’s most iconic legends in the field of engineering. We understand the spirit of innovation and sense of adventure that is shared by all great engineers; the boundless thirst for knowledge and the desire to defy expectations and shake up the status quo. It’s an attitude that has gotten us to where we are today on the global butterfly valve market but it’s certainly not something we started; we’re just the latest in a long line of British engineering names that have shaped their industries or – in some cases – the whole world. 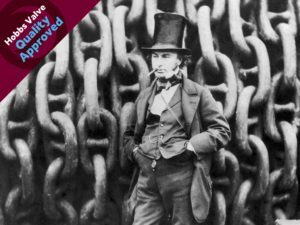 To start off we’re going to profile that titan of industry, the man most would think of when they hear the words “British engineering legend”: Isambard Kingdom Brunel. Born in 1806 as the son of an architect, he started his career assisting on the Thames Tunnel before succumbing to serious injury during a flood which killed several of his colleagues. Despite six months of recuperation, the young Brunel was undeterred and bounced back to begin a glittering career that would revolutionise engineering and construction in rail, at sea and in bridgebuilding. 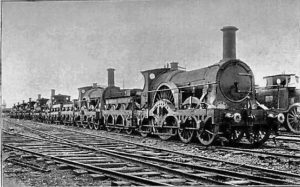 In 1833 Brunel was appointed chief engineer of the Great Western Railway and took it upon himself to innovate at every turn, including surveying the entire length of the route between London and Bristol himself and creating a new broad gauge of rail to improve train speed and passenger comfort. He designed London’s Paddington station and inspired many young engineers at the time to think outside of the box. As part of his career in the rail industry, Brunel designed many bridges including the Royal Albert Bridge spanning the River Tamar, Somerset Bridge near Bridgwater, the Windsor Railway Bridge and the Maidenhead Railway Bridge over the Thames (which still carries main line trains today, even though they’re many times heavier than those used in Brunel’s time). Working with the Great Western Steamship company, Brunel was given the opportunity to prove that steam was indeed a sufficient means of propulsion for transatlantic travel. The consensus at the time was that a steam ship would need to dedicate so much cargo space to fuel as to render its usefulness moot; Brunel contested that by building a bigger ship the storage capacity would increase dramatically while the propulsive power required to move it would increase by a far lesser degree. His first ship, The Great Western, proved him to be correct, completing its maiden voyage with a third of its stored coal still unused. In 1843 he launched the propeller-driven Great Britain, considered by many as the world’s first ever modern ship, using construction and propulsion methods still employed to this day. It’s incredible to think that one person’s engineering skill could so dramatically improve the state of play across industries but that’s how Brunel worked – he saw an engineering problem and set out to rectify it, even designing pre-fabricated hospital buildings to aid in the Crimean War. In 2002, he was ranked 2nd in a BBC poll to determine the “100 Greatest Britons”. 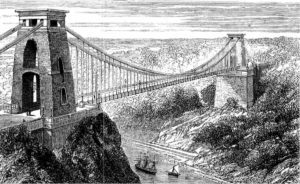 He is perhaps best known for his work on the suspension bridge in Clifton, Bristol, although significant changes to the design in later stages mean it’s disingenuous to give him full credit for the achievement. There’s no doubting, however, the importance of his status in British culture as a symbol of British engineering nous, drive, determination and innovation; that’s why he’s our kind of engineer!